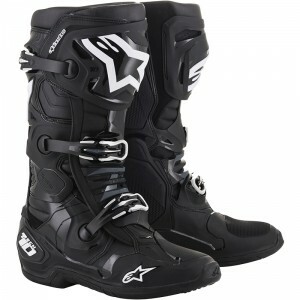 Alpinestars has been around since the invention of motocross and the company worked on the development of the motocross boots ever since. 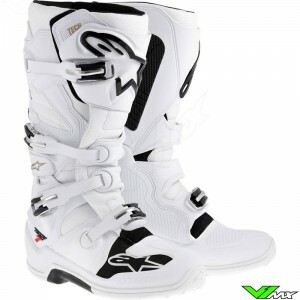 These years of experience have led to a wide range of top quality motocross gear. 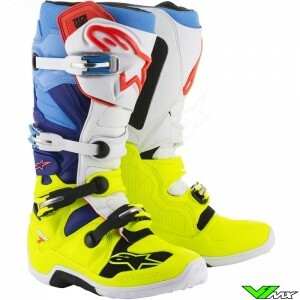 The Italian company is market leader and specialist in designing safe and comfortable boots. 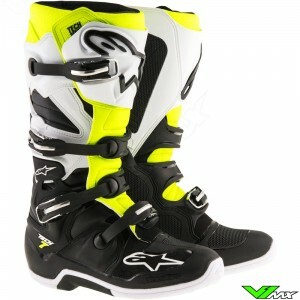 The entire collection of off-road Alpinestars boots is available at V1mx. The collection consists of 5 models. 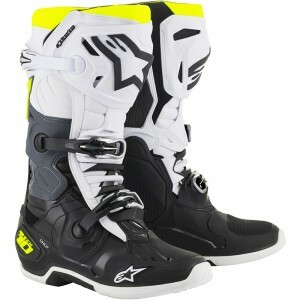 The most advanced model is the Alpinestars tech 10. 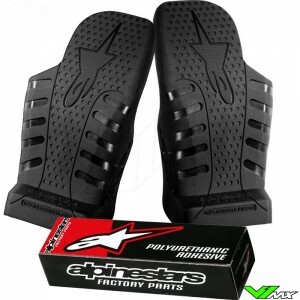 This model is very popular among the best motocross riders in world because of great features in terms of performance, protection and support. 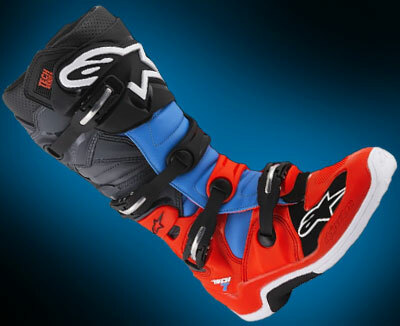 Riders like Jeffrey Herlings, Eli Tomac, Romain Febvre, Jeremy van Horebeek and Clément Desalle use these Alpinestars motocross boots to compete in the World Championship. 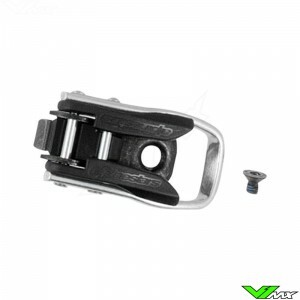 It protects the riders with an innovative bio mechanical system that consists of several hinge points in the inner shoe and a sliding blade system in the outer part. Check out all technical features on the Tech 10 page. 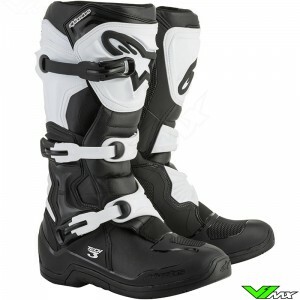 All Alpinestars motocross boots have an injected one piece foot shell , except the Tech 8. 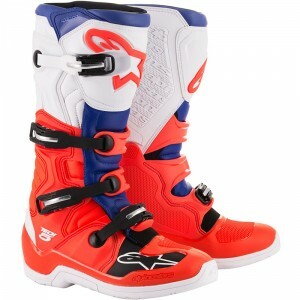 This model is made with a stitched sole, specially made for the riders who prefer this. It is equipped with an traditional steel nose and durable rubber soles. The stitched sole gives the boots an iconic look, but it is no compromise on protection. It contains an innovative design with two sliding blade systems for excellent freedom of movement, support and protection. In addition, this model is equipped with an inner bootie. The inside of the inner bootie is covered with foam and gel at the ankles, which ensures better shock absorption and comfort. The next model is the Tech 7. 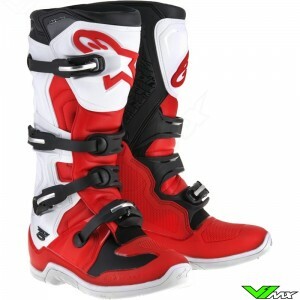 These innovative motocross boots are known for their low weight and excellent flex system. A combination of two types of hinge systems and a sliding blade system ensure top performance. Not only can the hinge system rotate, there is also room for movements in the longitudinal direction. 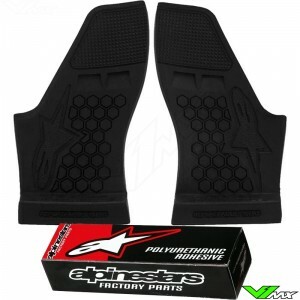 As a result, these affordable Alpinestars motocross boots offer excellent protection, support and flexibility. The Tech 7 also has replaceable sole inserts, so you can easily repair worn boots. 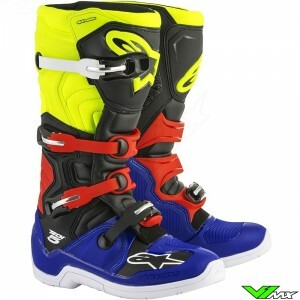 With more than 10 different color schemes, you can always find a pair that matches your motocross gear. 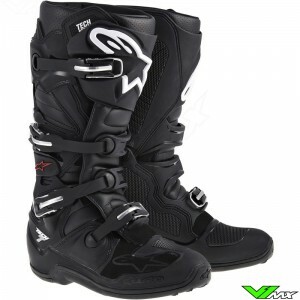 More information about these boots can be found on the Tech 7 page. 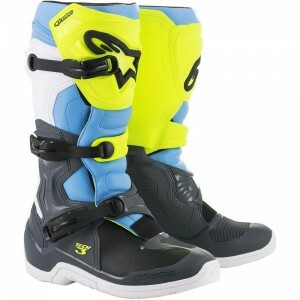 The Alpinestars Tech 5 is a more basic and cheaper model. 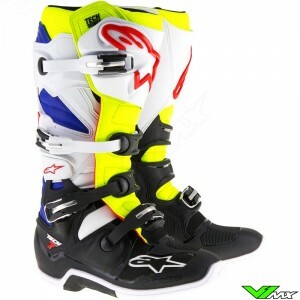 Many features of the more expensive models have been used to develop these affordable Alpinestars motocross boots. 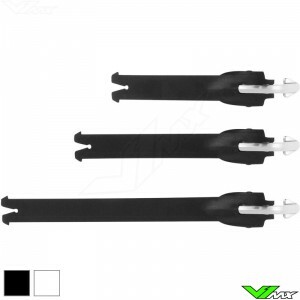 One of the strongest features is the excellent hinge point and flex system. This is a feature which is better than the competition in the same price range. 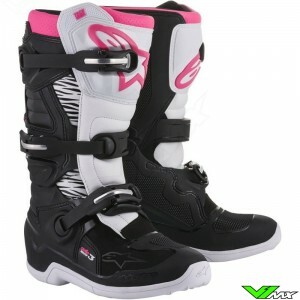 It is designed for novice to advanced riders who have a smaller budget. The extensive TPU protection plates and ergonomic design offer excellent levels of comfort and protection. 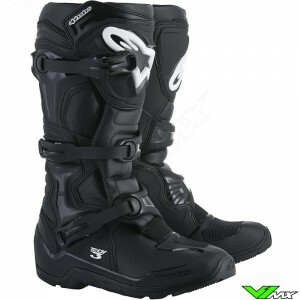 By adding grip pattern on the nose section and medial side, the boots help the rider by providing more control over the bike and gear pedal. 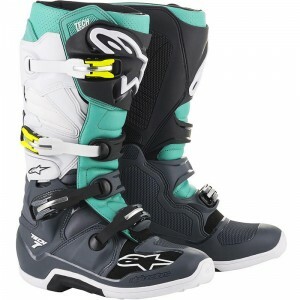 Just like most high end boots, these Alpinestars boots have 4 buckles that guarantee a good fit around the ankle. 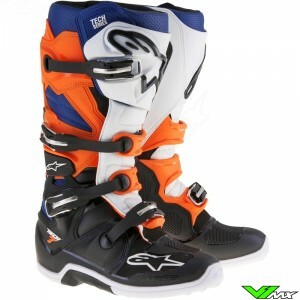 Are you looking for a cheap motocross boot with the quality of Alpinestars? 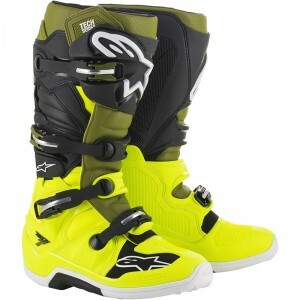 Then the Tech 3 is an excellent choice. This model has a smart design with many technical features of the top models, but in an affordable package. 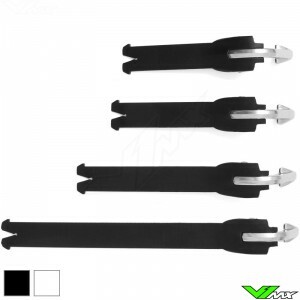 For example it has an innovative buckle system for a good closure. Flexibility and support is provided by the sliding blade system. The nose section has a low profile to make shifting gears easier. 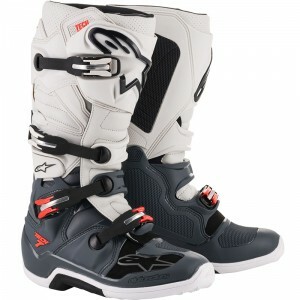 In short, these Alpinestars boots are an excellent entry model for novice motocross or enduro riders. 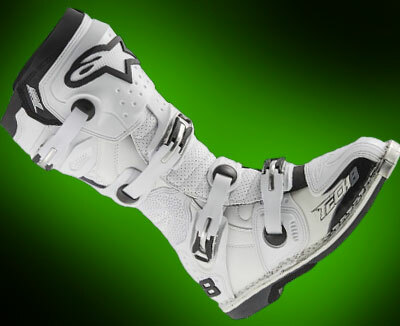 The Enduro version of the Tech 3 can be viewed and ordered in the enduro boots section. 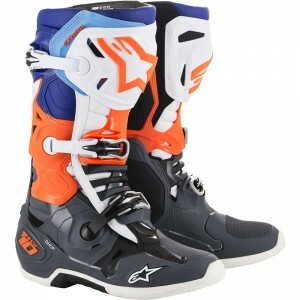 Alpinestars also produces a collection for young riders. The kids motocross boots can be viewed and ordered in the youth motocross gear department of the webshop. 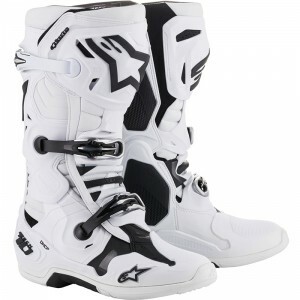 Alpinestars was founded in 1963, around the time that motocross had just been invented and gained popularity. The Italian brand has more than 50 years of experience in producing high quality equipment for motorsports. 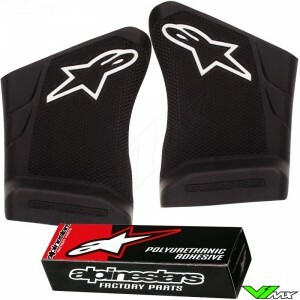 Besides motocross, Alpinestars is also active in the formula 1, road racing, karting and mountainbiking disciplines. The knowledge of materials and production techniques are used to improve products in terms of comfort, durability and protection. 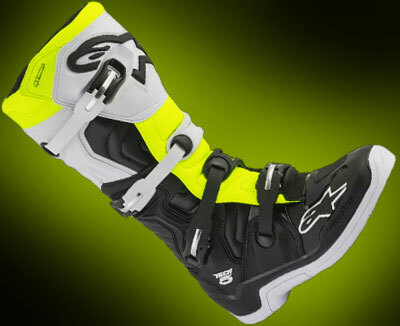 Alpinestars motocross boots are resistant to the toughest conditions by using the most advanced production and design techniques. The boots are also used by many profession motocross riders. Development teams work together with well-known riders such as Jason Anderson, Jeffrey Herlings and Eli Tomac. 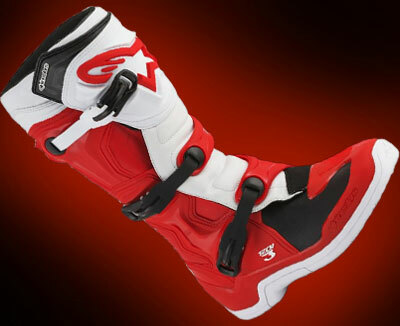 The feedback from the race experience is used to further develop the motocross boots. 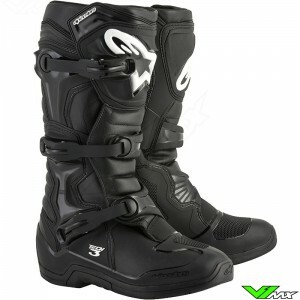 The boots are designed with experience of actual riders. This results in technical parts and features that help every rider perform. 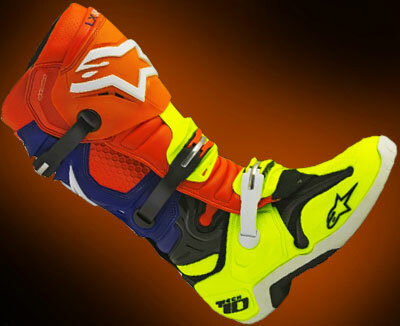 The titles won with Alpinestars motocross boots are really too many to mention. From the world championships motocross and American Supercross to the Dakar rally. Most of the titles have been won wearing the most advanced model, The Tech 10. This model is designed to help champions perform, which has been proven by the amazing results of the last decade. 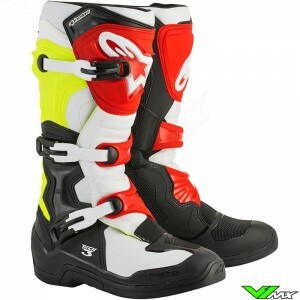 Do you have a question about the features of the motocross boots or about placing an order? Then feel free to contact V1mx. You can easily reach us by chat or e-mail, we will do our best to help you as soon as possible.